There is a great deal of new material to bring to the table based on this story. Below is a list, by category and author, of what has been added to the Dark Acquisitions page by the Keepers of Mysteries, based on this show. Further contributions from friends of the library will also be found there as they arrive. Congrats to Michael Markey for having run his first Road Crew Game at GloryCon 2016! The ambient background of the Sanctum Secorum was created using Horror Ambiance from Klankbeeld. Sanctum Secorum’s theme music was created using Seating Incantation by Landmark Entertainment. The Tales From The Fallen Empire DCC-RPG setting from from Chapter 13 Press has a barbarian class. By the way: Great episode. 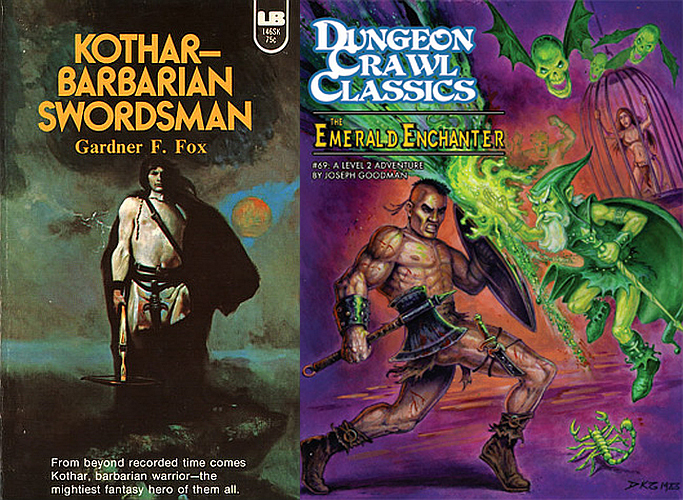 I loved the Kothar books.